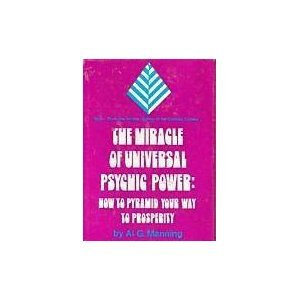 This was the first occult book I ever obtained that taught me anything about the seven chakras and how to use them in an occult and metaphysical manner. Manning’s text is primarily a method of using the chakras in various ways to make your life easier and more fruitful. It’s really not much different in approach than say what Regardie did with the Middle Pillar exercise which is a distillation of the seven chakras itself. Since I have taken time and copies Norvell’s method of the seven chakras, I would rather not go into detailing Manning’s method because it is more or less the same. If you wish to compare notes, grab the texts and compare for yourself. What I would rather do is give you some variations and tips that Manning offers in his manual that say Norvell does not offer. I highly recommend this book for experimentation as it can fit into any sorcery, magical or metaphysical paradigm. The practices are simple, adaptable and have great utility. I’ve used many of these techniques myself over the years with excellent results. Highly recommended. P. 34 Step 2. Build a mental image (thoughtform) of a magnifying glass in three-dimensional living color. Make it as bright and real as you can. We will use it to focus the Cosmic Light [Editor’s note: the light which feeds and charges your chakras] in the same way you would use a real magnifying glass to focus the sun’s rays and burn a hole in a piece of paper. Direct your mental magnifying glass to float around behind you and position itself in the shaft of Cosmic Light to focus a good measure of Light on the base of your spine at the root center. Feel the gentle warmth and tingling as the purification process begins; then feel the beautiful red flame of the root center as it grows and whirls; and as the center expands, feel a surge of vitality flowing into your physical body. Feel the blood dancing in your veins while every cell of your body vibrates with fresh life energy. Step #1: Build the thought/energy ball between your hands. It should be at least as big as a baseball and have a feeling of solidity and life. Step #2: Program the thought/energy ball with the clear picture of your desired result on the indigo ray from your brow center. Step #3: Now that it is programmed, your thought/energy ball can properly be called a thoughtform. Feed your thoughtform with green ray from your heart center, the red ray from your root center and any other psychic energy center that seems appropriate. Step #4: Put your thoughtform in a safe place and feed it twice a day with the clear thought of the end result and the various psychic center energies. Step #5: When you are sure it’s strong enough, send your thoughtform on its way to manifestation – or let it decide the right time and go on its own. Step #6: Accept and enjoy the tangible manifestation that is certain to come to you. To begin an absent treatment, take your deep breath and reach up with your hands for the healing energy just as if your patient were room with you, and use the same form of opening prayer. Then visualize the person in front of you, hold up your hands and direct the healing energy from your hands and the Blue Light from your throat center to bathe his aura and clean out each psychic center in turn. When the centers feel clear to you, direct the energy to any specific problems or parts of his body that need help. Then close with the prayer of thanks as if the person were with you, and go wash your hands. Visualize your body as a long bar magnet stretching from root center to crown center. We’re all familiar with the classic drawing of the lines of force flowing in graceful curves from one pole of a magnet to the other. To become a physical super-magnet, make an attunement with the Light as if you were starting the psychic development exercise. Use your thoughtform of a magnifying glass to focus the Light at your root center, then direct the energy to flow down and out from your root center in sweeping lines of force to curve out and re-enter your body through the crown center. Try it as an experiment just before you leave the house (for instance, your way to work). Get the magnetic energy flowing from your root center and leave the system turned on, taking it with you as you go about your daily routine. If you have built it all well, you will be amazed at the difference in the way even strangers and casual acquaintances react to you. ...the technique is visualize your thoughtform focusing a powerful ray of electric blue Light on the control spot of your limiting condition. See the powerful Light as a disintegration beam dissolving the limitation. Then offer a prayer to the Shiva Principle for help.